Stomach cancer occurs when cells within the body for some reason start to proliferate out of control, while creating and forming tumor mass. Tumor of the stomach can occur at any age and it is lot more frequent in men especially those between fifty and seventy years of age. Stomach cancer is one of the tumors with a poor prognosis if it is discovered too late. Even though we do not know the exact cause of this disease, it was found that there are certain risk factors that can contribute to the development of this type of cancer. These include feeding with frequent use of smoked and salted food, water where there are a lot of nitrates, excessive alcohol consumption and cigarette smoking. One of the reasons for gastric cancer is helicobacter, which is a major cause of inflammation and ulcers. The risk group includes those suffering from pernicious anemia, lack of stomach acid or atrophy of the stomach, as well as those whose close relatives have cases of this disease. Cancer of the stomach is very difficult to detect at an early stage, as the first signs of quite vague and quite similar to gastric problems. In most cases patients ignore the discomfort in the stomach, indigestion with the occurrence of heartburn, frequent burping, loss of appetite accompanied by disgust at the food (especially meat), irregular stools, bloating of the stomach after eating. These problems can be the result of the development of tumors in the stomach. In the later stages occurs a sense of taste in the mouth like rot and blood in the stool. Due to insufficient utilization of food or vomiting, the patient suddenly becomes thin and anemic. Unfortunately, patients usually come to see the doctor only when they feel pain, and then the disease is already in advanced stage. If gastric cancer metastasizes, the symptoms depend on the size and site of metastasis. If it spreads to the liver, it can reach its painless magnification, jaundice or swelling of the stomach due to accumulation of fluid in the abdominal cavity. Back pain occurs in the case of metastasis to the pancreas or spine. During the physical examination of the patient, the doctor checks the stomach which has accumulated liquids, whether there are swelling areas or other changes in the area of ​​the stomach and surrounding tissue, and in what condition the lymph glands are in. Blood analysis can show the existence of anemia, hepatic disorders or high levels tumor markers. But all this is not enough to establish a final diagnosis, but doctors if they suspect cancer of the stomach, usually opt for endoscopic-gastrointestinal endoscopy, which is running a special instrument - gastro scope, a thin flexible tube topped with installed cameras. Gastroscopy is a very reliable diagnostic method because it provides a direct insight into the state of internal organs, mucous membranes, and detect changes in the form of erosion, ulcers, polyps, tumors. The diagnosis can be set on the basis of X-ray of the stomach that examines the esophagus, stomach and the initial part of the small intestines. This examination is performed using contrast media - barium sulphate, which the patient drinks before the procedure. Further tests, MRI or CT, determines the degree of prevalence of the disease and on that basis the course of treatment is determined. The treatment of tumors of the stomach depends on the size, site and stage of the tumor mass and general condition of the patient, and involves the surgical removal of tumors, the treatment with chemotherapy and / or radiation. The only hope for a cure is provided by stomach surgery, which involves partial or total removal of the stomach and surrounding lymph nodes. In most cases it is impossible to remove cancer of the stomach completely, because the cancer at the time of diagnosis most often is in advanced stages. Sometimes during surgery removed are surrounding organs (spleen, part of the pancreas). 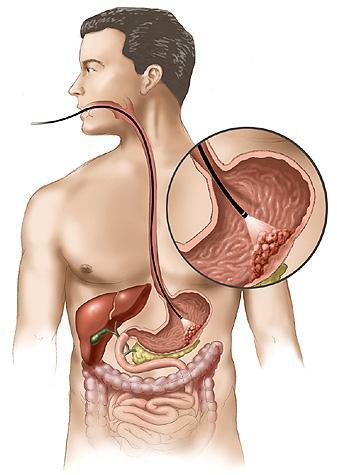 After surgery, the small intestine is connected either directly to the esophagus or the rest of the stomach. Radiation therapy and chemotherapy are introduced after surgery when it is necessary to destroy the residual cancer cells, or in order to prolong and improve the quality of life of patients with advanced tumors who cannot undergo surgery. Numerous scientific studies have proven that a daily intake of cured meat products increases the risk of this malignancy. These foods contain high levels of salt and a high percentage of nitrate which is probably the reason for the increased risk of cancer. Also, fat should be eliminated from the diet too salty and too spicy meals. For gastric cancer and its prevention it is necessary to eat more fruits and vegetables, especially cauliflower, cabbage, broccoli, soy, garlic and onions, carrots, kiwi and lemon, and use olive and linseed oil. It is recommended to avoid cigarettes and alcoholic beverages. Persons who had stomach surgery, often suffer from a sense of fullness that occurs due to the inability of the remaining part of the stomach or small intestine to receive all the amount of food. So to start it important not to exaggerate with the consumption of "heavy" foods that quickly saturate (cereals, cabbage, beans). Fluid intake before and during meals should be avoided, because it can create the illusion of fullness. The problem for these patients constitutes in a so-called "dumping" syndrome that starts immediately after a meal, and is characterized by a pressure drop, cramps, nausea, diarrhea, dizziness and fainting. The cause lies in too fast arrival of food in the small intestine and is therefore advised to take several small meals per day, avoid artificial sweeteners, sugar and fluid intake during meals. In the journal Medicinal herbs we came across a very interesting article from the famous herbalist Životić for the treatment of gastric cancer, but you do it this time we are in full. Mix one tablespoon of finely chopped leaves and dandelion root, plantain leaf, leaves and roots of chicory, leaf and flower of St. John's wort, couch grass root, leaf and flower milfoil, nettle leaf, raspberry leaf and blade of yarrow and all cover with 1.4 I of boiling water and leave it covered to stand for two hours. Strain and drink during the day. In each cup add half a teaspoon of pollen. At 10h and 16h eat two baked apples sweetened with honey. Mix two tablespoons of aerial parts of the flue pipe in the flower and one tablespoon of chicory root and nettle root, and all overflow with 8 dl of boiling water and leave it covered to stand for two hours. Strain and drink 2 dl before breakfast, lunch and dinner. In each cup mix the teaspoon of pollen powder. During the days, instead of water, drink mixture: mix one tablespoon of the aerial parts of knotweed grass, leaves and flower coltsfoot, plantain leaf, blackberry leaf, leaf and flower St. John's Wort and two tablespoons of leaf and flower of teucrium chamaedrys, and pour everything with 1.2 I of boiling water and leave it covered to stand for two hours. Strain and drink during the day. Mix one tablespoon yarrow leaf, leaf and flower of teucrium chamaedrys, plantain leaf and two tablespoons of leaf and flower of milfoil and flower of St. John's wort, and all cover with 1.2 I of boiling water and leave it covered to stand for two hours. Strain and drink 2 dl before and after breakfast, lunch and dinner. During the day, instead of water, drink tea mixture: mix two tablespoons of plantain leaf and spoonful of leaf and flower of Coltsfoot and leaf and flower of teucrium chamaedrys, and pour with 8 dl of boiling water and leave it covered to stand for two hours. Strain and drink during the day. Mix one tablespoon of dandelion root, rhizome celery, chicory root and two tablespoons of nettle leaf, flower and leaf of milfoil and leaf and flower of St. John's wort, and all overflow with 1.6 I of boiling water and leave it covered to stand for two hours. Strain and drink during the day. Before breakfast, lunch and dinner, eat one tablespoon of finely ground seeds of fenugreek mixed with a deciliter of tea or freshly squeezed juice from fruit or vegetables. At 10h and 16h eat two baked apples sweetened with honey. Note: With each meal eat a salad of fresh cabbage and dandelions.